The Honda CBR650F is here and we are very excited. First of all, the Honda CBR650F is a very promising motorcycle because it's supposed to be a fast machine but not intimidating so that new, less skilled riders have a chance at falling in love rather than shrivelling up in fear. Second, it's one more option for the mid-weight segment motorcycle buyer. Third, the entry of Honda into that market sort of validates that there is a viable business proposition in the premium segment. Most Indian manufacturers, whether they admit to it or not, look to the big ones, Hero and Honda, not always in that order, to see what they're up to as a sign of future business trends. It isn't always an accurate trend - look at how badly both brands have been doing in the premium segment historically - but there you have it. Finally, the CBR650F is a CKD. As in, Honda imports kits and assembles them in India for sale. That's great news because no manufacturer does that without having a longer term plan for assembling other models. Let's get on the bike. 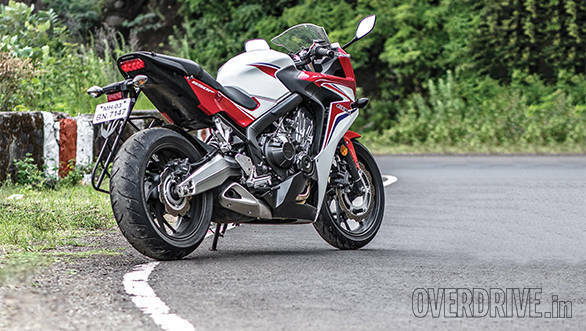 Here's what you will love about the CBR650F and what you won't appreciate all that much. India isn't a mature premium motorcycle market and we still purchase the lion's chunk of motorcycle for what they represent as a status symbol rather than what they do. In that continuum, the presence of an inline four, with its smooth wail and revvy power, is always the top of the pyramid. It's the reason why the Benelli 600i, otherwise a pleasant, unexceptional motorcycle, is a motorcycle that gets a lot of test rides, if not sales. Because it's a four. So far, the mid-weight segment has seen everything but a strong inline four. There are terrific parallel twins like the Kawasaki Ninja 650/ER6n as well as terrific (but expensive) inline triples like the Triumphs. The Kawasaki Z800 has been a popular inline four but the CBR650F has the cachet to beat them all. First, it's a Honda and that's a big one. Second, it's a four and a CBR-branded one, no less. And finally, it wears a proper sporty-looking fairing. What's not to like? Honda developed this 649cc 16-valve DOHC inline four for a very specific purpose. It's a motorcycle for the emerging markets and for new riders to enjoy. The former means cost is a factor and the latter means too much power might actually be a problem rather than a selling point. Hence, the Honda makes substantial torque from fairly early on. Don't be fooled by the fact that peak torque is 62.9Nm at 8,000rpm. The Honda's on it from about 3,000rpm and past 7,000 it starts to get even more urgent. The last 2,000rpm are inhaled with a thin shriek from the stock exhaust that I'm sure many would change to something more fruity - find out about what happens to your warranty before you do, chaps. The point is that this is, by design, an engine that is both friendly and uncomplicated. The construction and engineering favours cost-effectiveness rather than exotic materials and the power delivery is smooth, easy to understand and urgent enough to keep you interested. Top speed should be north of 230kmph and to me that's more than enough for our roads by miles. Again, a high top speed isn't about going flat out in our chaos. It's about finding a sweet cruising speed that's fast enough to cover the miles on the highway while staying somewhere in the middle of the performance envelope where it's peaceful rather than frantic. Honda's motorcycles have a very specific flavour - they're about as neutral as they come. What that means is that the pace at which the motorcycle responds to your inputs, especially when changing direction, feels utterly natural. It neither lags behind your efforts, nor feels too eager to please. The CBR650F is like that. Steering geometry isn't too sharp and it works wonderfully with the nature of the engine and the role of the motorcycle. The CBR feels completely natural whether you're making a slow turn on an urban road or strafing a fast, high lean corner out on the highway. The Dunlops offer tons of grip, the suspension has the capability to deal with some pretty gnarly bumps mid-corner and you'll find the CBR650F confident and supportive at all times. It's a beautiful setup. That's a blessing because the setup is also non-adjustable. Which means you only get preload adjustment on the rear monoshock. Ride quality, similarly, is excellent. It is a sporty motorcycle but it can handle bad roads quite well. You're hardly ever out of your seat. The front suspension also makes light work of some pretty large hits and that makes the motorcycle feel like you could confidently bad-road it if you needed to. The CBR650F may only get a steel diamond frame, basic right-side up forks and a preload-adjustable rear monoshock, but don't be fooled. More than any other thing on the motorcycle, the chassis knows how to use what it's got to produce maximum benefit. The CBR650F has ABS as standard and that's a great asset to the new rider. ABS-aside, the CBR has powerful but friendly feeling brakes that you can use confidently. We rode through the rain for this story and at no point did we feel the need to back off the pace because the Dunlops and the brakes, both felt excellent even in difficult conditions. The initial bite is extremely well-judged and you should be able to produce terrifically quick stops should you need to. Given how easy-going and confident the bike is though, chances are you won't need to. As impressive as the Honda CBR650F's core performance is, whether from the engine, the chassis or the brakes, it isn't perfect. Here are the things that bugged us. I know you've been reading everywhere that the CBR650F is the epitome of refinement. I'm going to tell you different. The Honda is actually very, very refined. There is no harshness or noise you can complain of at all. However, as most Hondas (again) do, it has a teeny-tiny bit of vibration, buzz really, in the bars that tell you the motor's humming along smoothly. The problem is that the buzz rises to its peak between 100 and 125kmph (in top gear) and that's where you'll usually be cruising. On a two hour run, this buzz is enough to leave you with tingly hands. This is not a dealbreaker but it is definitely a niggle. And just so you know, there are many, many multi-cylinder as well as single cylinder motorcycles that will do the same cruising speeds without the tingle-hands happening. The buzz is specific to that speed range and it doesn't become an issue at street speeds at all. If you like how the CBR looks, you can just skip ahead because design is a personal taste thing and I've no axe to grind with you on this front. I think the CBR650F looks terrific from the back - apart from that over-engineered saree guard. The sides are typically Honda-design and I really like how the layered fairing with its faux carbon fibre textured black panels reveals the engine so neatly. However, the small triangular headlamp in the front? It makes the CBR look meek and middle-of-the-road to me and I don't like that. 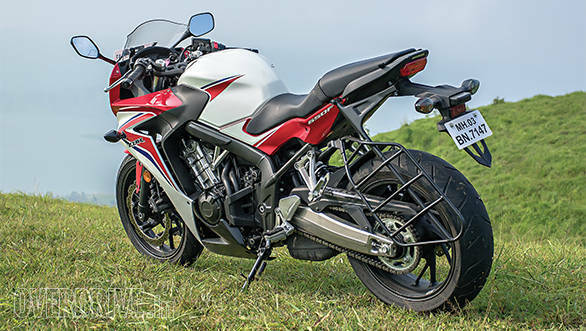 While we are on the subject, let me also point out that despite reports from Honda's launch event, the CBR is rather well built and finished and I would submit that Honda should ensure that all of its Indian products meet the same quality, build and finish standards that the CBR650F subscribes to. The big one for me is heat. The clutch case sticks out and is just ahead of your right shin. I found that when I slid down the seat up to the tank or placed my foot lower to use the rear brake, my shin (protected by thick textile pants as well as a fat shin plate on riding boots) made contact with this case cover. I felt the heat but this wasn't a problem for me. If you're out riding in shorts - you should ask yourself why - then you're going to have more trouble with it. Outside of this, I felt the heat through the pants on the CBR a bit more than usual and that usually means riders in denims or less will feel it a lot more. Another thing to keep an eye on during the test ride. If you compare the Honda's price to the Kawasaki Z800 and the Triumph Street Triple, it isn't badly priced, again contrary to what you will read. But the Street Triple is a very, very expensive CKD motorcycle while the Z800 is the best priced CBU on our market. This paints a less flattering picture of the Honda. The real issue is actually the Ninja 650. The twin-cylinder Kawasaki makes just 12PS less but is a full Rs 2 lakh cheaper than the Honda. That's a big jump in price and while a Honda is a Honda and all that, the Kawasaki isn't Rs 2 lakh less motorcycle. The Honda CBR650F is a very likeable, extremely capable motorcycle that marks the start of the company's CKD line in India. It does have a few relatively small niggles and a fairly high price tag but it is a motorcycle well-suited to our conditions and we expect it to do well. Watch out for a full road test in the October issue of OVERDRIVE, out soon.